To take a great landscape photo, two of the most important personality traits to have are patience and faith. The best landscapes aren’t just about the view, they’re about the moment. They make you wait and fill you with doubt that you might be wrong or that the moment will never arrive. On the island of Kauai overlooking the famous vista of Waimea Canyon, Matthew Kimble’s patience and faith were tested. As part of the #BeAlphaHawaii trip, Kimble arrived at the Waimea Canyon overlook to find wind and rain. That’s not atypical for that spot. Waimea Canyon doesn’t give up the stunning view easily. Kimble saw the opportunity for more than just a pretty view. He saw the chance to capture a fleeting moment when the conditions, the light and the vista would align. So, with his Sony α7R III and 16-35mm f/2.8 G Master lens, Kimble waited. How a photographer used a Sony α7R III and 16-35mm GM lens in rain & blustery winds above Waimea Canyon to capture a dramatic, unusual & moody moment of the iconic vista. Photo by Matthew Kimble. Sony α7R III, Sony 16-35mm f/2.8 G Master lens. 1/400-sec., f/7.1, ISO 100. 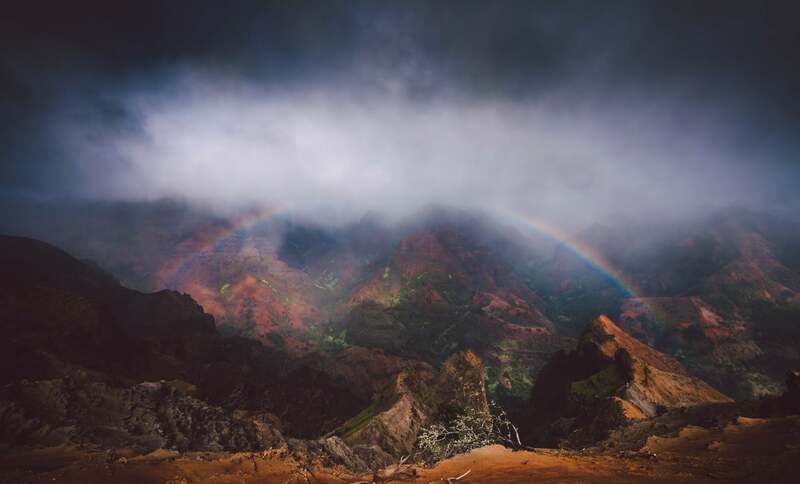 Waiting in rain and blustery winds above Waimea Canyon for the perfect moment, Kimble captured a dramatic, unusual and moody moment of the iconic vista.